Step 1. Click here to start the process. Step 2. Go to "Publish" and "Deploy from manifest". Step 3. Select "Production" and click on the link provided. Step 4. Accept the terms and conditions and select preferences. Step 5. Authorize the connector. Step 6. Fill in all of the required fields. API key: go to app.seomonitor.com -> Settings -> Account settings -> API token. Site ID: go to app.seomonitor.com -> click on the campaign -> copy the 4- or 5-digit ID from the URL. Select the API endpoint you want to use - the documentation is available at https://docs.seomonitor.com/api/v1/. Insert parameters (check the API documentation for required fields of each endpoint) - param_1=value_1,value_2,value3&param_2=value_1,value_2,etc. Step 7. Click Connect (top right). Step 8. Check the fields and click on "Create report". Step 9. Click "Add to report" to add the data source. Step 10. Select the type of report (table or pie-chart). Step 11. Add the fields from the right side. Step 12. To change the API endpoint, select the tab with connector fields. 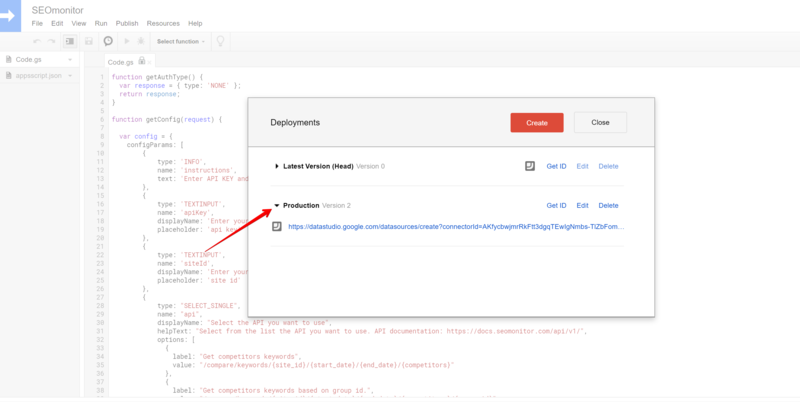 You can read a bit more on how to export data from SEOmonitor: from the interface or via API. For any questions, reach out to us via the in-app chat or by email to customer.success@seomonitor.com.